Listed below are the children's books I am currently working on. 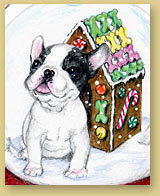 It is my heart's desire and goal to not just write, but illustrate, (in the case of picture books), my own stories. I am a work in progress. 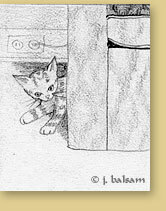 Neil: A Most Unusual Kitten - a fish-out-of-water story I wrote and illustrated when I studied with Uri Shulevitz a number of years ago. Since that time, Neil has undergone numerous changes to be current with the times. At right, a drawing from my original dummy which does not yet reveal why Neil is so unusual. 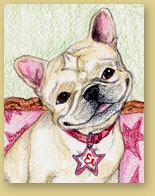 Etoile - Etoile is a city girl, a French Bulldog who believes she knows what's best for her. Unhappy with a decision made by Mama and Papa, she makes her own decision with some very unexpected results, and must find the resources within to resolve her dilemma. Etoile, Nana and the Trail of Stars - I would love to see this petite Queen of Everything as the heroine of her own series. In this tale, Etoile's eyes are opened to a world she's never known - an animal shelter - and she discovers how much of a difference love can make to another. Where Do Butterflies Go at Night? - My only picture book in rhyme, perfect meter, and quite magical. Has the potential for curriculum tie-ins. Benny's Bugs - A boy-friendly picture book in which Benny, inspired by the bugs in his garden, comes up with a creative solution to a frustrating problem. With bug illustrations and fun insect facts for kids, this book also offers the possibility of curriculum tie-ins. 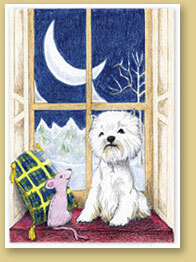 Wes and Pip Fetch the Moon - Two best friends, a West Highland White Terrier and Pip, a stuffed toy rat, have a winter adventure inspired by Wes's mistaken perception of what he sees outside their window . But can he put aside his terrier drive to get what he wants when his best buddy needs him most? Champ - The Dog Who Waited - The story of an older dog abandoned in the city by his owners and his journey to finding a family who'll love him forever. If someone is willing to give him a chance, will he be able to trust again? The Small World of Little Fee - this story is short on words, but big on heart. Little Fee is a young feral cat who finds an oasis of safety on a kind person's porch. His is a simple life, but not without the many perils inherent in being a cat who has never been touched. 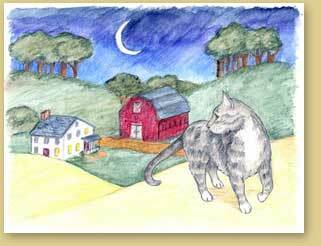 Simon's Secret - Simon, the family's pet cat, feeling old and weary, leaves his home on the farm and Kara, the little girl who loves him. In a magical journey, Simon finds the way to be healed and return to his beloved Kara. A Pterodactyl Kind of Day - What happens when a young pterodactyl wishes really hard for something special, slips through time, and finds himself with kids his age ... but human? Lots of fun, but a lonely young ptero who doesn't know how to get back home. Maya's Enchanted Snow Globe - Maya began as a picture book, a story of a young pup, Maya, an evil toymaker, and no small amount of magic. Critiques by editors and agents have envisioned this story in every children's genre possible with whatever story changes needed. However, Maya's story is ultimately served best as a middle grade novel. A work in progress. Broken - Juliana is a 12 year-old girl whose lifelong dream of owning a horse has finally come true. She faces many challenges in being a newcomer to a barn with highly competitive girls and in gaining the trust of Sunny, a horse rescued from the auction. This is a story of love and redemption for both Sunny and Juliana, and one with a unique inspiration from the other side. A work in progress. An illustrator's agent at an earlier illustrators' conference was so excited by these book ideas, she told me to drop everything and do them immediately, (not as easy as it sounds!) Both are exciting projects and require excellent illustration. Neither of these ideas are currently on the market, so I'm not so much as tipping my hand with even a title!